In stock -This product will ship today if ordered within the next 8 hours and 26 minutes. Ener-C Tangerine Grapefruit is an age-old tale: grapefruit meets tangerine, and together they make taste bud magic as the world’s most delicious citrus combination in Ener-C Tangerine Grapefruit. Marrying Ruby Red’s forbidden fruit with the tangy kick that only comes from a ripe Satsuma tangerine, this gorgeous duo tastes as bright as it looks. 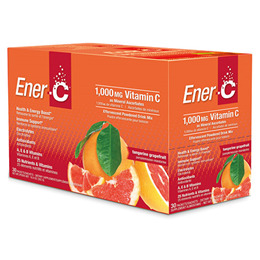 Ener-C is full of 25 nutrients and vitamins to make you feel and perform your very best. Have a look at our Supplement Facts table to see what’s in our wonderful packs of Ener-C.
Fructose, citric acid, natural tangerine flavor, sodium bicarbonate, tapioca maltodextrin, beta carotene, purple sweet potato powder, malic acid, silicon dioxide, tartaric acid, natural grapefruit flavor, natural orange flavor, cysteine hcl, glycine, stevia. Take one sachet up to 2 times a day, with food. Do not use with other potassium-containing supplements or with potassium-containing salt-substitutes, Do not use if you have a gastrointestinal ulceration or obstruction as it may cause nausea, vomiting, diarrhoea, abdominal cramps, discontinue use and consult a health care practitioner if these symptoms are severe. Consult a health care practitioner for use beyond 6 months. Below are reviews of Tangerine Grapefruit Vitamin C Drink - 30 Sachets by bodykind customers. If you have tried this product we'd love to hear what you think so please leave a review. Ener-C Tangerine Grapefruit is an age-old tale: grapefruit meets tangerine, and together they make taste bud magic as the world’s most delicious citrus combination in Ener-C Tangerine Grapefruit.